A hosts v holders contest awaits on Friday when the UAE meet Australia in Asian Cup 2019’s last quarter-final. Neither nation has enjoyed a plain run to this point. The biggest upset at the tournament to date came in the opening group matches when the Socceroos were humbled 1-0 by Jordan, while a pair of penalty shootout saves from goalkeeper Mathew Ryan were required to see off Uzbekistan in the round of 16 after a goalless draw. For the UAE, they’ve stumbled past weaker opposition. In the previous stage, they twice gave up leads versus tournament-debutants Kyrgyzstan prior to substitute Ahmed Khalil’s extra-time spot-kick securing a 3-2 win. Zacch’s plan comes to fruition? Maybe, this was Zaccheroni’s plan all along. Stultifying tactics have been the main feature of the Whites’ play throughout the tournament, even though they are joint-third highest scorers among the quarter-finalists. Only in the 1-1 draw with Thailand that closed their commitments in Group A did three recognised defensive-minded midfielders not start. Against Kyrgyzstan, Zaccheroni chose to narrow the pitch in a 4-3-2-1 formation. Chances came and went through the unusually wasteful Ali Mabkhout, prior to his redemptive goal and penalty win, but the overall performance in the 3-2 extra-time triumph was a tough watch for the near 18,000 supporters at Zayed Sport City. Entertainment, however, is low down the list of priorities from now on. Simply finding a way past the celebrated Socceroos is all that is required. The UAE have been here before. Under Mahdi Ali, they wowed four years ago Down Under ahead of a meeting with Javier Aguirre’s hotly fancied champions, Japan, in the last eight. A defensive masterclass from the underdogs – allied with some suspect finishing – then saw a memorable upset recorded on the way to a memorable third-placed finish. Australia ended their run in the semis. Few will complain about the method if history repeats itself. 😎 UAE's @alimabkhout07 🇦🇪 was once again on the scoresheet with this cool finish, is this your goal of the Round of 1️⃣6️⃣? With the competition nearly three weeks old, injuries and suspensions are taking effect. For the Socceroos, a soft yellow card for majestic playmaker Tom Rogic against the Uzbeks guarantees a reshuffle. Hertha Berlin winger Mathew Leckie promising first minutes of the tournament after injury also gave Graham Arnold plenty to ponder. In response, the head coach cryptically stated he could he “could change the system and play with two strikers, two number nines, we could play with a diamond midfield”. In all likelihood the 4-3-3 formation will remain, Queens Park Rangers midfielder Massimo Luongo coming in for the banned Rogic. Leckie’s recovery has put pressure on one-goal-striker Jamie Maclaren’s spot in the starting side. 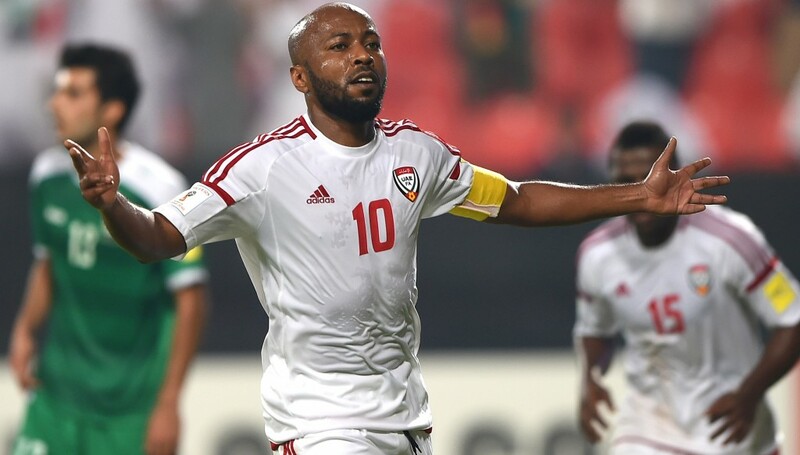 Al Jazira centre-back Fares Juma replaced the seriously injured Khalifa Mubarak on Monday for the UAE and will do the same job from the start against the Socceroos. Shabab Al Ahli Dubai Club’s Majed Hassan is a seamless replacement for Al Wasl’s suspended anchor man Esmail. A more-taxing decision for Zaccheroni is whether to award Khalil’s continued heroics off the bench with a first start in the UAE. This would probably be at the expense of fitful Jazira creator Khalfan Mubarak. @socceroos skipper Mark Milligan says the return of Mat Leckie adds 'another dimension' as Australia looks forward to an @afcasiancup quarter final with hosts United Arab Emirates on Saturday morning (AEDT). The influence of the video-assistant referees will, belatedly, be felt in the quarter-finals. Like at World Cup 2018, it will only be used for: goal or no goal, penalty-kicks, red cards and mistaken identity decisions. The results of both nations up to this point may have changed if it had been applied earlier. In the rollercoaster 3-2 triumph against Syria in Group B, a clear hand ball from Socceroos skipper Mark Milligan in the box went unpunished. Moments later, Omar Al Somah tripped over a fellow Syrian and a spot-kick was erroneously awarded. 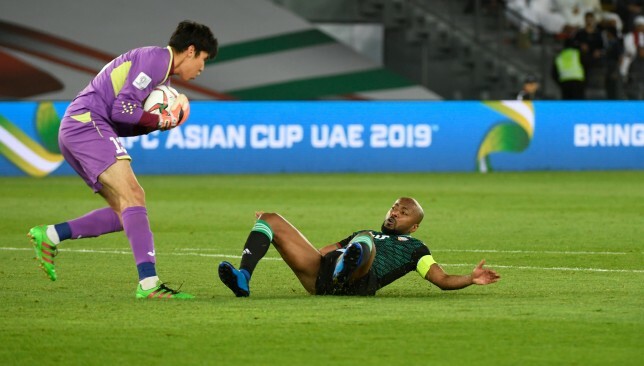 The UAE also required the softest of handball calls against substitute Mohamed Marhoon to salvage an opening 1-1 draw against the Bahrainis, through Khalil’s 88th-minute penalty. Either way, there can be few legitimate complaints about the officiating from now on. Ismail Matar started his first Asian Cup 2019 game against Kyrgyzstan. UAE icon Ismail Matar insists winning is more important than playing well after the Whites reached the quarter-finals of the Asian Cup on home soil. 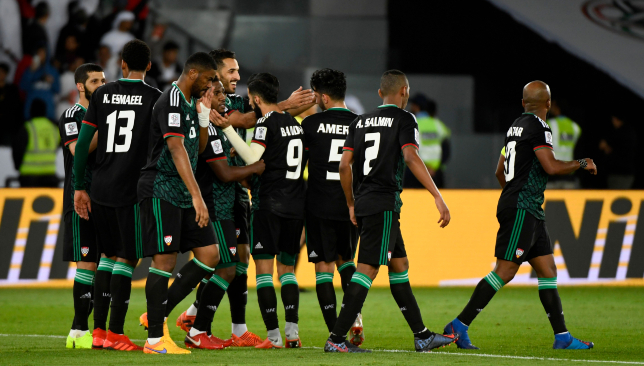 Pretty football has not been a trait of the UAE’s style of play in the Alberto Zaccheroni era – a far cry from the exhilarating football the nation played on their way to third place at the tournament four years ago in Australia. Ali Mabkhout finished as the Asian Cup’s top scorer in 2015 as the Whites upset record four-time champions Japan to finish third. But the hosts have flattered to deceive under the dour tactics of the Italian veteran, stumbling into the last eight with draws in the group stage against Thailand and Bahrain, while they needed extra-time to beat Asian Cup debutants Kyrgyzstan 3-2 on Monday. But Al Wahda warhorse Matar – who is the UAE’s second most capped player behind Adnan Al Talyani following 129 appearances – would rather his team still be in the tournament playing poorly than losing playing well. Matar is the UAE’s second most capped player of all time. “Today was like this is one game, you want to play well or you want to win. We want to win,” said the 35-year-old forward after Ahmed Khalil’s extra-time penalty earned the Whites victory. “We don’t want to play well today. Playing well didn’t help Saudi Arabia (the Green Falcons exited on Monday after a 1-0 defeat to Japan). They played a really good game and at the end of the day, Japan won. “Sometimes in this kind of game you look always for winning. You don’t look for a great game. The big lesson for us was Japan against Saudi Arabia. Japan are the better team, but they respect Saudi Arabia, they had the possession more, we saw them all in the defence. “When you want to win a title you have to do whatever makes you win. Matar, who made his senior Whites debut 16 years ago after starring for the under-20s at the 2003 FIFA U-20 World Cup – where he was named Player of the Tournament – added that facing a smaller, unknown nation in the round of 16 also prevented the UAE from playing with flair. “This is football. When you play a 50-50 game, like we see today between Japan and Saudi Arabia, you can show your quality, you can show your personality more, because it’s a 50-50 game,” said the veteran, who has spent his whole club career with the Clarets, save for a loan period at Qatar’s Al Sadd in 2009. “When you have the pressure on you and you have to go an attack and score and have to win, it’s always pressure. Sometimes you don’t know how to play. Matar impressed in the win, his first start of the tournament after two previous appearances off the bench against Thailand and India. Zaccheroni’s side led 1-0 and 2-1 through Khamis Esmail and Mabkhout goals before Mirlan Murzaev and Tursunali Rustamov forced extra-time. And even though his lack of game time left him fearful, Matar said he drew on his vast experience. 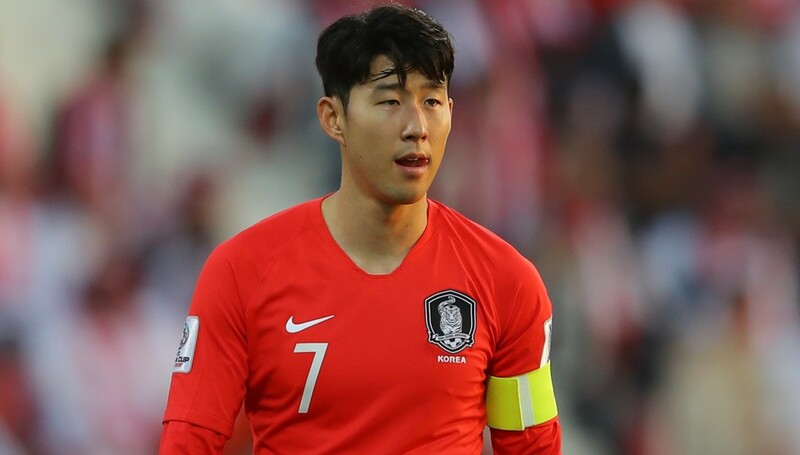 Tottenham star Son Heung-min does not feel he’s being unfairly targeted after the South Korea skipper helped steer his side into the Asian Cup quarter-finals following a hard-fought 2-1 win over Bahrain on Tuesday. The 26-year-old darling of his nation spoke to reporters after the match with a visible bruise on his left ear after he received a boot to the head in a physical encounter. He was also subjected to rough treatment during his bow at the tournament as he provided two assists in the 2-0 victory over China last Wednesday as Korea finished top of Group C.
But Son played down suggestions that opposition players were targeting him – despite a diminished impact as the Taegeuk Warriors secured their passage into the last eight, where they play Qatar on Friday. “No, never in football, it’s not about being targeted,” said the Spurs schemer after Korea’s 2-1 extra-time victory. Son assisted both goals in Korea’s win over China, but was less influential against Bahrain. Son, who has been in sublime form for Spurs this season, forming a fearsome foursome in attack with Harry Kane, Christian Eriksen and Dele Alli – he has scored 12 goals in 28 appearances in all competitions – has also had to adapt quickly to conditions in the UAE. He only flew out following Spurs’ 1-0 Premier League defeat to Manchester United at Wembley 10 days ago. “You know, it’s about the mentality. I’m tired of course after the game, but I’ll try to recover as quick as possible and play again,” he said when asked about the possibility of playing potentially three more games of 120 minutes if Korea make it to the Asian Cup final and have to go the distance each time. Korea advanced to the last eight following a gritty win in which goals from Hamburg’s Hwang Hee-chan and Jeonbuk Hyundai Motors left-back Kim Jin-su earned Paulo Bento’s side victory. Some of Asia’s heavyweights remain in the competition, including record four-time winners Japan, the continent’s highest ranked team in FIFA, Iran, as well as reigning champions Australia, who Son and Co could come up against in the last four if both sides win their quarter-finals. And Son feels Korea can reach the final, although he is not looking beyond Friday’s clash in Abu Dhabi. “Why not,” he said. “We’re looking forward to playing a quarter-final which is going to be a very tough game like today, so we’re looking forward. We got the result. The performance was not great but sometimes you take the result. Son also touched on Korea’s tribute to Newcastle United midfielder Ki Sung-yueng, who had to return to England from the Emirates after picking up an injury. Team-mates held his No16 shirt aloft as they paraded around the Rashid Stadium pitch following full time in Dubai on Tuesday.